Palliative home care enables Clients to remain in their own homes to receive end-of-life care. It can be very distressing to see how a terminal illness affects a loved one. This is where Acquire Care can help, by providing specialist support with the day-to-day things so your family can make the most of your time together. Having palliative care at home means your family member or friend can remain in the place they feel most comfortable, surrounded by their memories and the people they love. 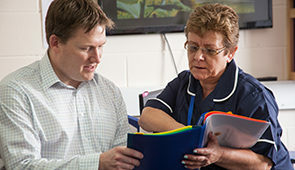 With the one-to-one support of a compassionate carer, who is experienced in palliative care, they will have specialist support whenever they need it. One of the main benefits of palliative care at home is that it allows somebody to pass away peacefully in their own home, with someone they know and trust nearby. As well as being reassuring for the person receiving care, knowing this can give peace of mind to families and close friends too. Not having care in a hospital or hospice also means less disruption for everybody: it’s usually easier for friends and family to visit at a person’s home. Round-the-clock care also means that any changes in condition will be noticed and responded to quickly. Family members can carry on with their lives, knowing they will be notified of any developments. Whether you’re looking for a full-time live-in carer or a carer for those times when you need some extra help, Acquire Care can provide the full range of care services for palliative and end-of-life care. For personal care, overseeing medication, cooking meals or sharing memories over a cup of tea, our support covers whatever you need. If you’d like to find out more about palliative care and how we can support you, please call our friendly and helpful team of advisors.